One of the coolest experiences of my recent time in Bangkok was being able to take part in a Thai cooking class. There's a number of places and institutions that offers Thai cooking lessons but the one I chose was Silom Thai Cooking School (which I'll refer here on out as STCS) not only because of its budget friendly price but because of the glowing reviews I read from previous attendees. STCS offers courses everyday of the week with time blocks being split into morning (9AM - 1PM), afternoon (1:40PM - 5:30PM), and evening classes (6PM - 9PM). Each day has two different courses you can take (A or B) with slightly different menu options. The B option is offered for those who have already taken an A course and want to try something different. The daily course lessons slightly differs by day and course option but you can take a look ahead of time at the course schedule to know exactly what to expect. A special private chef course is also offered for those truly wanting to learn and is 10,000 baht a day. For a mere 1,000 baht, you're given instructions and a hands-on experience on how to make some 4-5 different dishes but also given a market tour and introduction to important ingredients in Thai cuisine and a glimpse at traditional Thai preparation and cooking methods. You also get to eat all the dishes you create and a nice simple cookbook of all the dishes you made and more from the school. I emailed the school on Sunday to inquire if there were spots the very next day and was given a prompt, thorough, and cordial response from the school and was confirmed an afternoon spot and told to come to the meeting point (which was described in great detail by the school) by 1:40 PM the next day.This happened to not only be my first Thai cooking class but my first official cooking class ever so I wasn't sure what to expect but I'm glad I went! The meeting point is a bit of a walk from the Silom BTS station but only about a 10 minute walk and not difficult to get to. I was enthusiastically greeted at the meeting point by a friendly employee named Mai who immediately made me feel welcome while introducing me to my classmates. I had a wonderful and diverse group for my classmates with new buddies from Brazil, Indonesia, Dubai, London, and more. After all of us were assembled, each one of us were given a wooden basket and a bottle of water before being introduced to our cooking instructor, the awesome chef Non, who led us across the street to the local market. Those in the afternoon class are at a slight disadvantage only because the market begins and closes early, around 1-2 PM. So by the time we got there, many of the stalls had already closed shop for the day and gone home. FYI - on STCS' website, it states that for the evening class, the produce is brought into the classroom for the market tour portion. Nevertheless, chef Non took us to a still open stall and began educating us on the different ingredients and produce that are commonly found and used in Thai cuisine. This was a great way to get a crash lesson on what makes up the great flavors of Thai food and Non meticulously explained the different produce, how to differentiate between similar produce, and allowed us to touch, feel, and smell the ingredients too. After, we loaded all the produce we were to use for our cooking in our baskets and walked to the school. This market tour before the cooking was not only informative but reassuring to know we were preparing and cooking food with fresh ingredients we picked straight from the market! For each of our cooking lessons, we were brought into the large lesson room next door which would always be draped in beautiful carpets and traditional cushions to sit comfortably on. Before we came in each time, the floor would have all our cooking utensils, ingredients, and other needed items laid out for us which made things very easy and quick. What STCS really excels in is not only teaching you how to cook Thai food but really gives you a full sensual experience; you're not just sitting in a sterile white kitchen and hearing an instructor drone out the steps but you get to really see, smell, feel, hear, and of course, taste it all with new friends and a friend-like instructor. The layout was always beautifully arranged and the different ingredients and spices arranged in an enticing way. Seriously. How can you not get pumped to start cooking after seeing that setting? I have to say though, the knives provided were really dull and not very sharp... they definitely could use a bit of sharpening! For each cooking lesson, we would gather round to listen to chef Non who would explain the ingredients, the process, and how to prepare our dishes. With a very friendly and humorous personality, Non made us all feel at ease as he would crack in jokes in between and share stories and such so that the whole experience was a relaxing one. We first began prep work for both our first dish, tom yum goong and our final dish, sticky rice with mango (khao niaow ma muang). We got a look at what tamarind looks like and how to prepare it by soaking it in water before smashing. In pairs, we worked to squeeze out coconut pulp for the milk by squeezing and straining several time to get a good amount. Chef Non also showed us how to get the coconut water out and demonstrated the Thai way of getting the pulp out with a traditional Thai utensil in which one sits on the wooden part and uses the metal edge to scrape out the meat. We also got a look at the traditional way of cooking sticky rice which is done with a metal pot and wooden basket to steam it all. The different condiments and sauces used for each dish is always measured out and prepared ahead for you but the preparation of the ingredients is done either individually or communally such as when we are split to do certain tasks like cleaning the shrimp and such. And chef Non gave us pointers including how to use a knife to squeeze out the juice from a lime. With our ingredients prepped and ready, we walked out with our ingredients to the hallway where the cooking station is located. And heat or no heat, it definitely didn't dampen the spirit and energy of our diverse and awesome group! For the tom yum goong cooking our pans held a bit of water in which all the ingredients were thrown in with a bit of coconut milk. After a bit of cooking and stirring the soup began to infuse with the various ingredients and spices which created a lovely aroma. In a matter of minutes, the tom yum goong was ready and each person dished out his or her creation into a serving bowl with a garnish of sliced peppers and cilantro on top. In the cool air conditioned dining room, we sipped and ate our first dish and everyone marveled at not only how relatively easy it was but how delicious it tasted! Psyched about our first Thai dish, we were eager for the next round. The next dish we were taught to make was the arguably best known Thai dish, pad thai. Interestingly enough, as famous as it is in the world, it's not as commonly eaten in Thailand and almost always just bought from the stalls on the streets for a quick meal. But you can't argue that it isn't tasty and again we were instructed on the different ingredients and condiments that went into it and, after a bit of prep work again, we were back at our stoves, ready to get cracking on our first pad thai. This time our pans were heated with oil before we first added the ground ginger, shrimp, and tofu. After letting them fry up a bit, in went the egg which was scrambled up another minute or so before adding the noodles, spring onion, and condiments. The noodles softened as it cooked while soaking in all the great flavors. Chef Non would walk around and let us know what to do all the time so no one ever felt lost or unsure of what to do. Each of our serving dish for the pad thai came with sugar, ground peanuts, chili flakes and a lime wedge on the side for personal taste. I ate my pad thai up with all the chili, peanuts, and lime but definitely left out the sugar as I found it already plenty sweet from the tapioca sugar. Still, another superb dish. The next dish was laab gai, which is a minced chicken salad but this was almost entirely prepared by chef Non in a matter of minutes. The ingredients were all prepared beforehand and was simply mixed and then served on spoons for each of us to try. It was tasty though a tad rushed. But when you're trying to learn how to prep and cook five different Thai dishes in some 4 hours, you do have to cut a bit of corners where you can, I suppose. I was, however, very impressed at how accommodating STCS was. One of the lesson takers was a nice flight attendant from the Czech Republic who didn't eat chicken. Once our chef learned of this, he went and made another laab gai, this time with shrimp, just for her to enjoy. How awesome! What came next was the complicated dish of our day, the green curry with chicken (geang khew wan gai). Amazingly, we worked on this dish completely from scratch, meaning we began by making the curry paste. Using a traditional mortar and pestle, we tossed in shallots, ginger, lemongrass, kaffir lime rinds and other flavorful ingredients. The base of green curry is the green chilies which are surprisingly not spicy but one-by-one we added chilies we chopped and took turns grinding everything in the mortar and pestle. As chef Non explained to us, some Thai mother-in-laws judged the kitchen skills and subsequent potentials as a bride of a potential daughter-in-law by the sounds and skills of her mortar and pestlin' and so we were judged by chef Non on our potentials haha.. Unfortunately (fortunately?) for me, I was given a so-so grade as a potential daughter-in-law based on my mortar and pestle skills.. haha. But soon as the chopped chili were added and ground by us, the curry paste took on a greener hue as the smell of chili spread in the air. Our other ingredients for the curry filling were chopped and prepared before taken out once more to our pans where they were added with some oil, our freshly made green curry paste, and a big ladle of coconut milk. This dish took a bit longer to cook than the previous dishes but we all worked hard to stir and combine everything, even as the fiery heat blasted our faces heh. We labored hard but remained in good spirits, even stopping to take a few group pictures. Here's our selfie-loving chef Non as he took a pic of our group (but focused on himself haha :P). With our curry thickened and cooked, we ladled on serving plates with rice and brought it back to our dining room to dig in. The curry paste made from scratch really made a huge difference resulting in a bold curry that was so complex and rich in flavor that balanced wonderfully with the mellow rice. The ingredients to make the fresh curry paste is difficult to obtain in Korea unfortunately, so I'm not sure how easily I'll be able to make it from scratch here but I did get my hands on some pre-made green curry paste and am eager to try out next time. In any case, this was definitely one of my favorite dishes we made and well worth the effort. The coconut milk we extracted and cooked with the sticky rice was presented last with some mango for some mango and sticky rice (khao neeo mamuang). By this time though, we were all really, really, stuffed. As delicious as the rice was- which had soaked up in the creamy, sweet coconut milk- I had to leave most of it behind while digging into the mango lest my stomach exploded. With that, our time together finished and we spent the last few minutes taking pictures together and saying bye to our newly made friends. Overall, I have to say STCS is a great experience at an unbelievable, bargain price of 1,000 baht. There were some promotions going on at the time so I only paid 900 baht! With a market tour and the teaching and subsequent preparing and cooking of five dishes in 4.5 hours it really packs a lot in in the few hours you have but didn't feel too rushed or at a frantic pace. Because it's so much information in a limited amount of time, I would say it's less a cooking lesson and more a cultural experience to get a feel of the basics of Thai cooking - almost like a requisite, 101 course essential to advance your studies in the matter later on. And STCS really excels in giving a cultural experience with attention paid to detail. The utensils, ingredients layout, even the colorful carpets and tablecloths for example, all provide a very sensual experience so all your senses are always entertained. Importantly, the food itself is very delicious and completely fresh and from scratch. By the end of your class, you're not only left with a happy and stuffed belly, but a deeper knowledge and appreciation for Thai cuisine. The handy dandy cookbook of favorite Thai dishes and ingredients for each class taker was a wonderful gift that'll help remind you on how to recreate these dishes in your own kitchen. And lastly, the staff are all wonderful, so friendly, and helpful. Our instructor chef, Non, was such a witty and friendly guy but the rest of STCS' staff were also superb. They made sure to help the classmates get to their various next appointments and destinations and even walked with some of the members headed to the BTS station. In the end, the class at STCS really felt less like a cooking course but like we had come over to a friendly host's house to cook and eat and share a brief moment together. 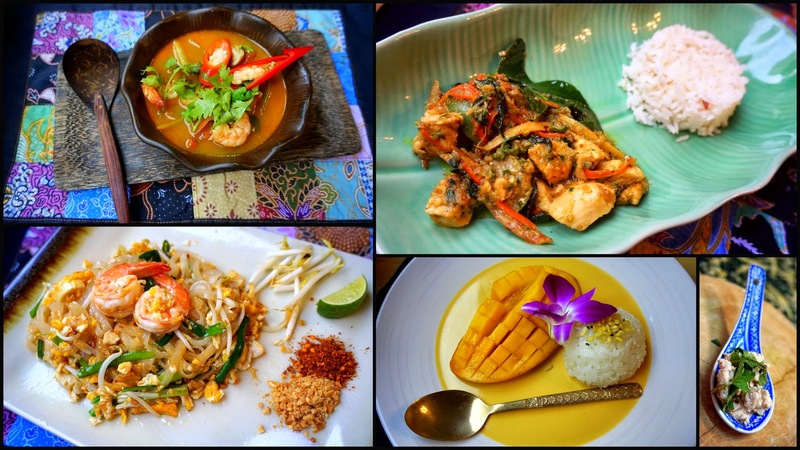 If you're already an advanced Thai cook or have experience in it, some of the more rigid and advanced courses offered around Bangkok may be a better choice. But if you're a beginner and looking to get a warm and humanly introductory course to the vast and richness of Thai cooking, I can't recommend STCS enough which should be a fantastic experience for people of all ages and backgrounds. My classmates were all varied in their cooking experiences but I'm certain no one felt out of place or any of it over or under his or her skill level. Rather, we all had a delightful experience together as the time flew by so there's really no deterring for anyone to sign up if interested! Thank u so much for sharing this experience. Will sign up when going to bangkok this June!